The name of Harlequin derives from Old French Hellequin, leader of la maisnie Hellequin, thought to be related to the Old English Herla, a character often identified with Woden. Italian Arlecchino by folk etymology was associated with Latin Herculinus, “little Hercules”. Although illustrations of Arlecchino have only been dated as far back as 1572, the character had existed before this date. The origins of the name are uncertain: some say it comes from Dante’s Inferno, XXI, XXII and XXIII; one of the devils in Hell having the name Alichino. Popular theories suggest that he may have come from France, Africa, or Italy. 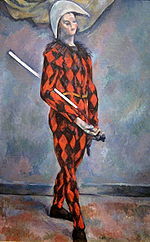 The notion that the Harlequin motif grew out of France is evidenced by Hellequin, a stock character in French passion plays. Hellequin, a black-faced emissary of the devil, is said to have roamed the countryside with a group of demons chasing the damned souls of evil people to Hell. A fool can ask more questions in an hour than a wise man can answer in a year. A dead man is mourned seven days; a fool, his lifetime. A fool who can keep silent is counted among the wise. ~ by meanderingsofthemuse on April 1, 2011.